Exciting news! 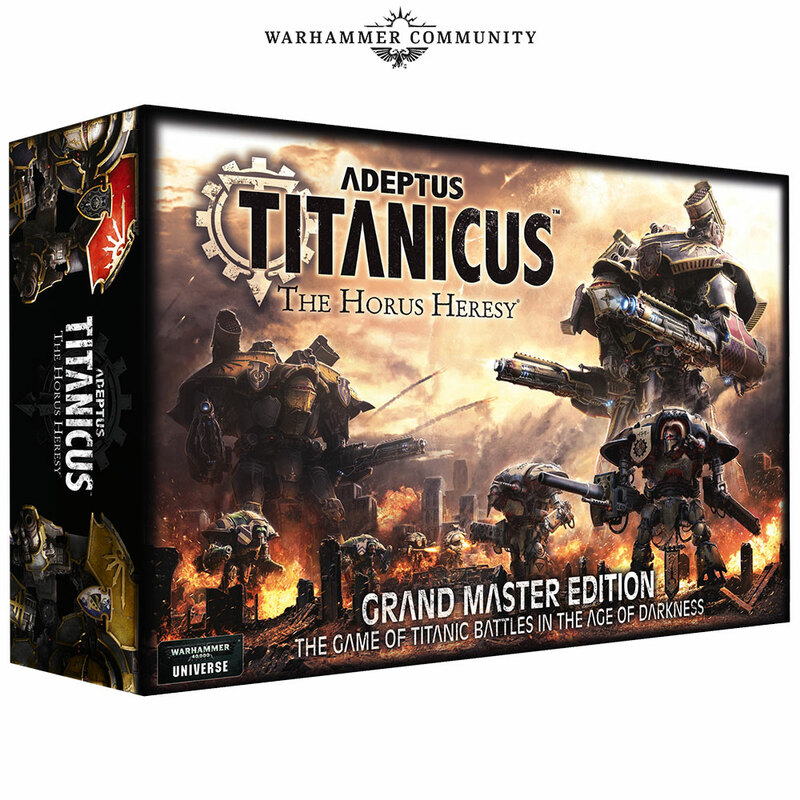 The eagerly awaited Adeptus Titanicus is up for pre order this Saturday! No price details yet, though we should finally find out this week! Adeptus Titanicus is nearly upon us, offering you, for the first time in over a decade, the chance to experience war on a whole new scale. Adeptus Titanicus is a brand new system that pits maniples of titanic war-engines against one another on a deep, tactical level designed to simulate the unique nature of these colossal clashes. 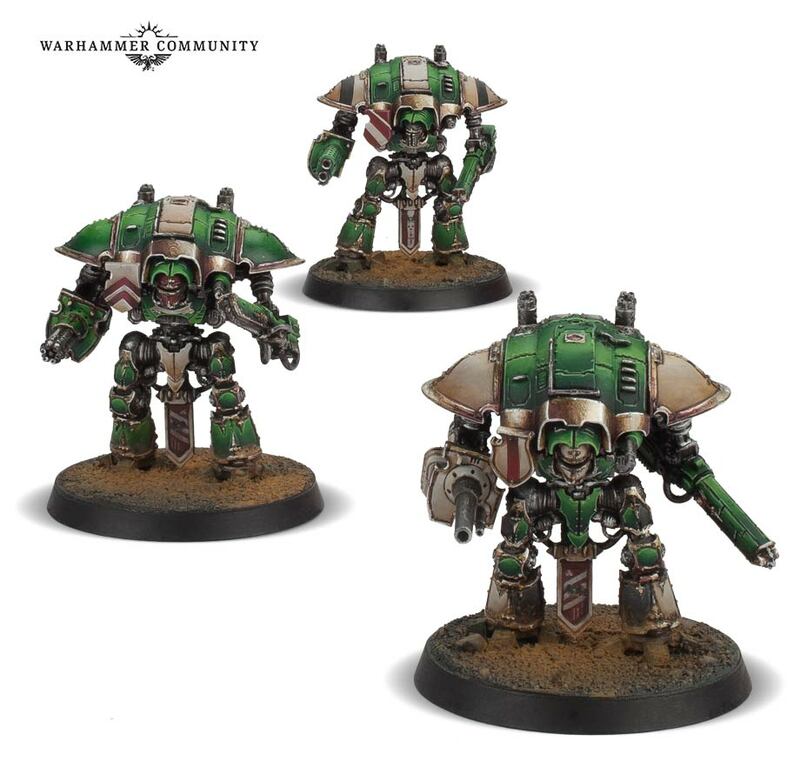 Split a set with a friend and you’ll have a Warlord Titan and a lance of Knights each to battle with – collect one for yourself, and you’ll have a solid core for your own Legio which can easily be expanded in future. To help commemorate the momentous launch of this new version of Adeptus Titanicus, those who pre-order the Grand Master Edition will receive a special collector’s coin. Stocks are strictly limited, with only 1,000 coins available worldwide – so make sure to pre-order early to avoid disappointment. If you’re not ready to make the jump to getting the Grand Master Edition (or you’re splitting the set with a friend) then the Rules Set is ideal. This boxed set is more than just a rulebook, containing command terminals, weapon cards, tokens and markers to track your games, tactical assets, measurers and loads of dice. 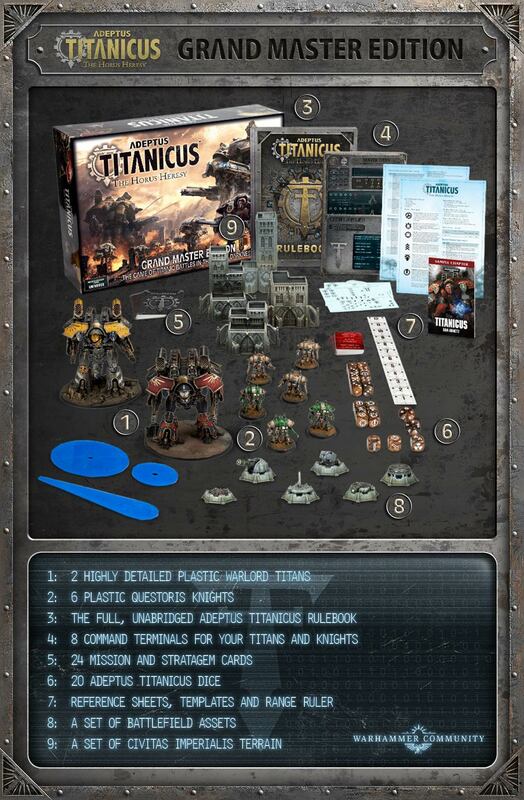 In short – all the accessories you’ll need to play your games of Adeptus Titanicus in one handy package. 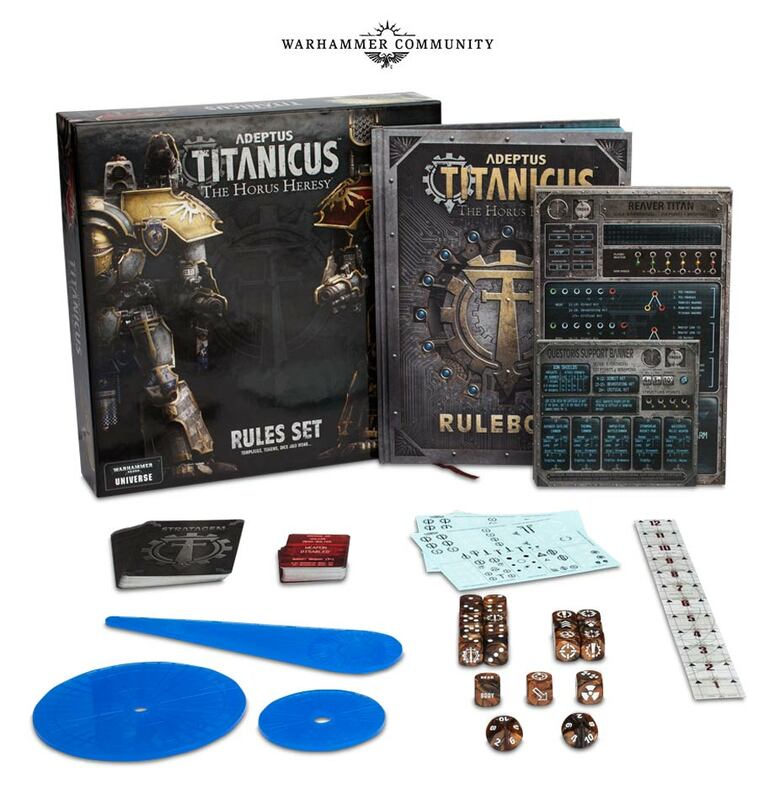 On release, you’ll be able to reinforce your Titan Maniple (or just revel in the joy of owning a Warlord Titan) with a new plastic kit designed for Adeptus Titanicus. This is one of our most advanced sets ever, designed to fully capture the incredible detail of its big brother while being as intuitive and rewarding to build as all our plastic sets. 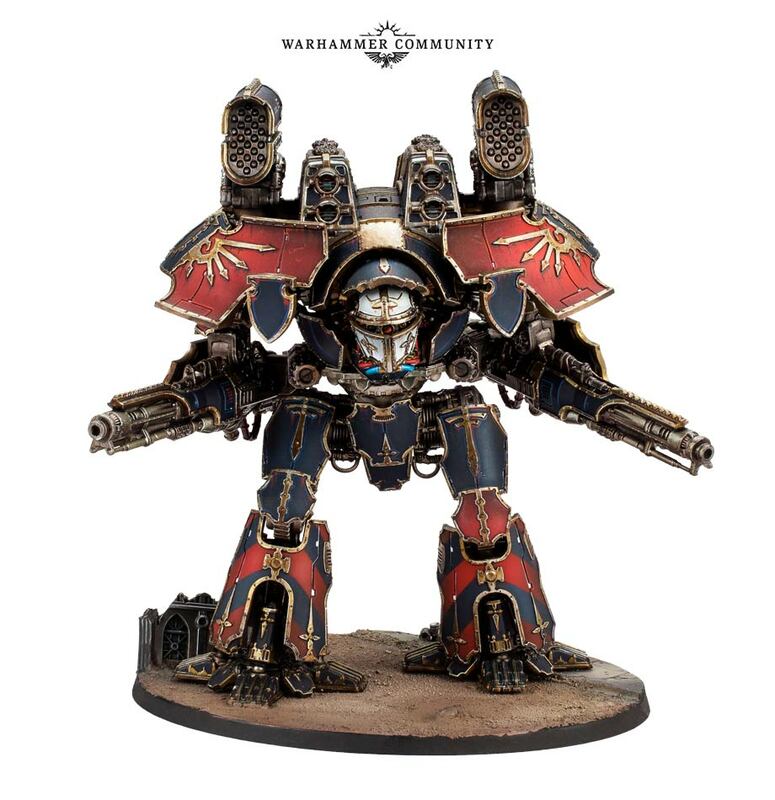 From head to toe, every part of this kit can be posed as you wish, allowing you to model your Warlord Titan however you please – running forward, staunchly holding the line or crushing a puny Knight beneath its mighty tread. 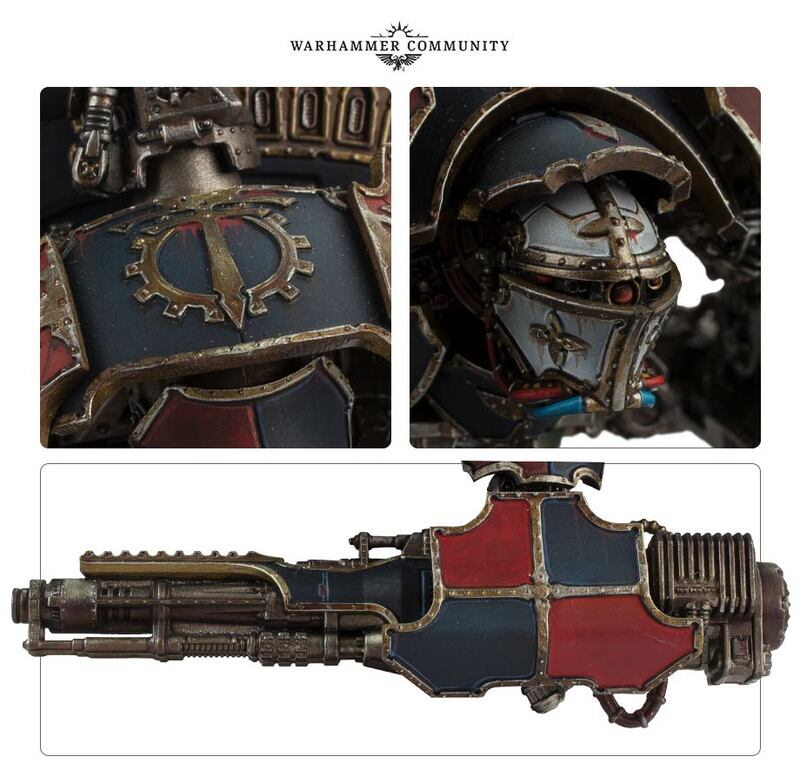 For those of you looking to customise your Warlord even further, all the weapon fittings have been designed with pre-fitted slots for common sizes of rare-earth magnets, so when we release more Warlord Titan weapons in future, you’ll be able to swap them out with ease. It says a lot about Adeptus Titanicus that the mighty Imperial Knight is one of the smallest units in the game – but make no mistake, these valiant crusaders are invaluable to success on the battlefield. When Titanicus launches, you’ll be able to support your Titans with a boxed set of three new-scale plastic Knights. 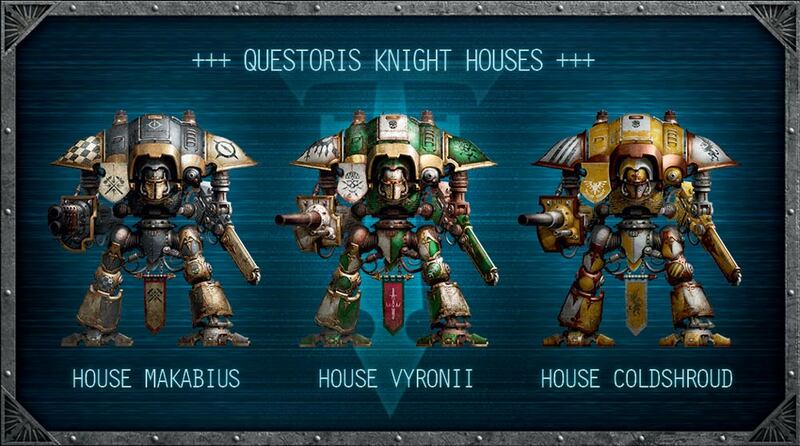 You’ll be able to customise yours with weapons, faceplates and tilting shields, while teeny transfers let you dedicate your lances to four iconic Knight Households of the Horus Heresy – Vyronii, Makabius, Coldshroud and Malinax. Command Terminals display all the rules and points for your units, meaning bookkeeping in a game of Adeptus Titanicus is simple, with no flicking through army books to check unit entries required. 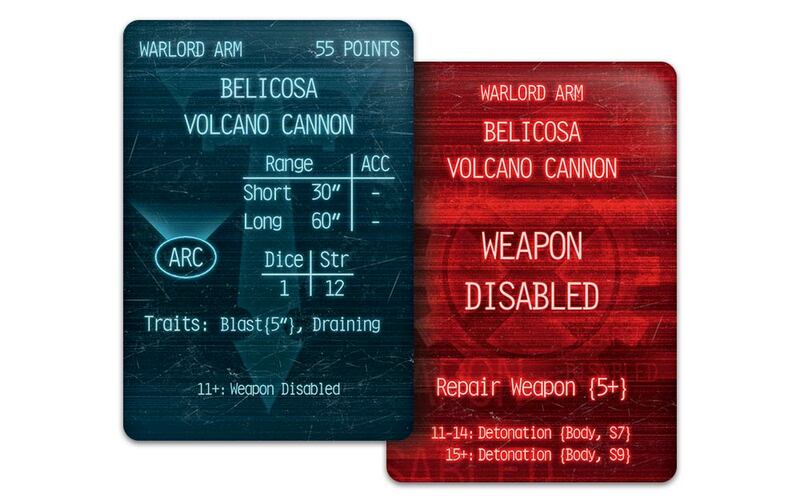 The weapon cards are a particularly cool touch – each double-sided card can be added to your Command Terminals to display just what you’re equipped with. 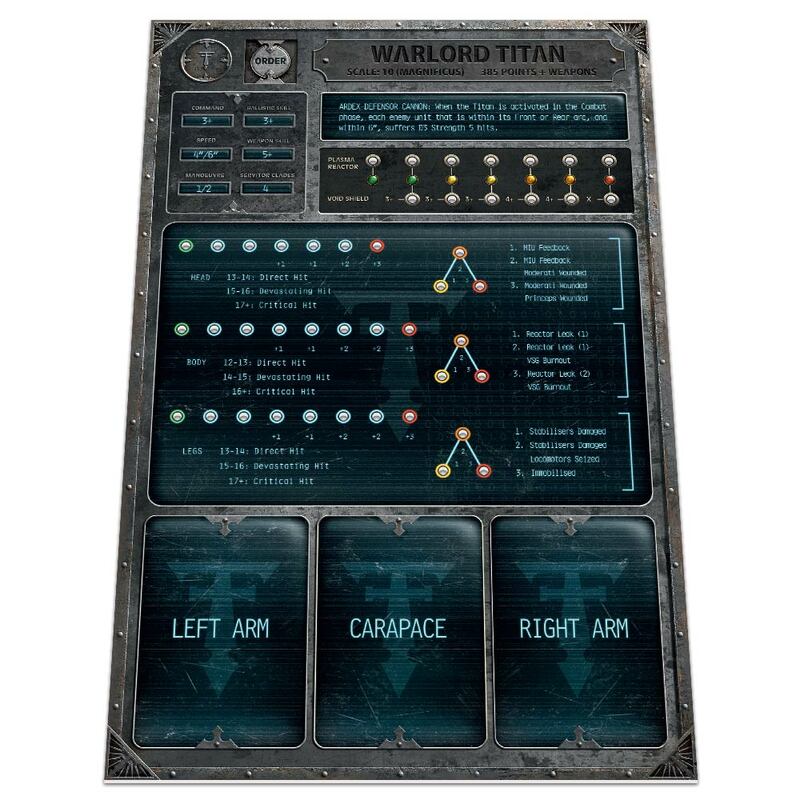 You’ll find Command Terminals for various classes of Titan and Weapon cards to match in the Adeptus Titanicus Grand Master Edition, as well as in the Rules Set and separately upon release. Last, but not least – how do you build your battlefield? The new scale of Adeptus Titanicus required a new type of terrain, so we designed the Civitas Imperialis sets. 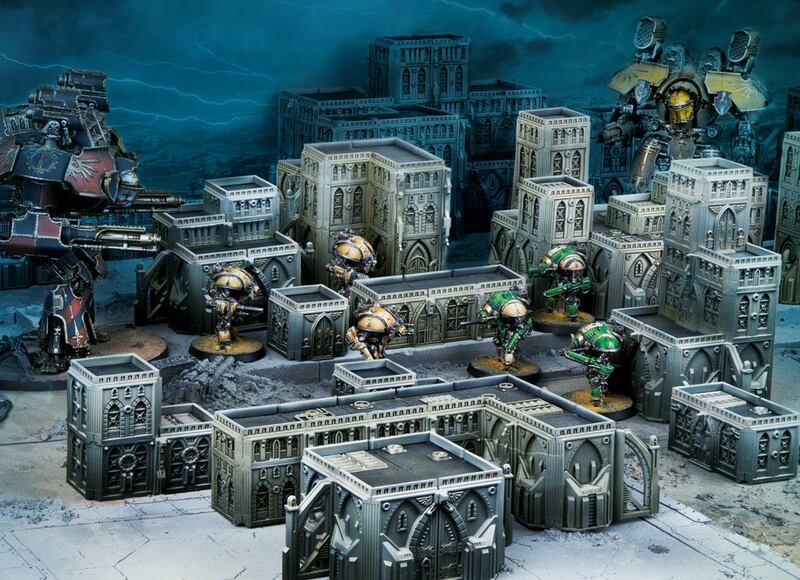 Highly customisable, modular, stackable and designed to represent the hab-blocks and civic centres of the fledgeling Imperium, these kits can be used to design anything from low-lying colony complexes to soaring skyscrapers. With just a couple of kits, you’ll have enough terrain to provide some crucial cover for your Titans and build thematic boards for your battles. You’ll be able to get your Civitas Imperialis terrain in the aptly named Civitas Imperialis set, or as part of the money-saving Civitas Imperialis bundle. 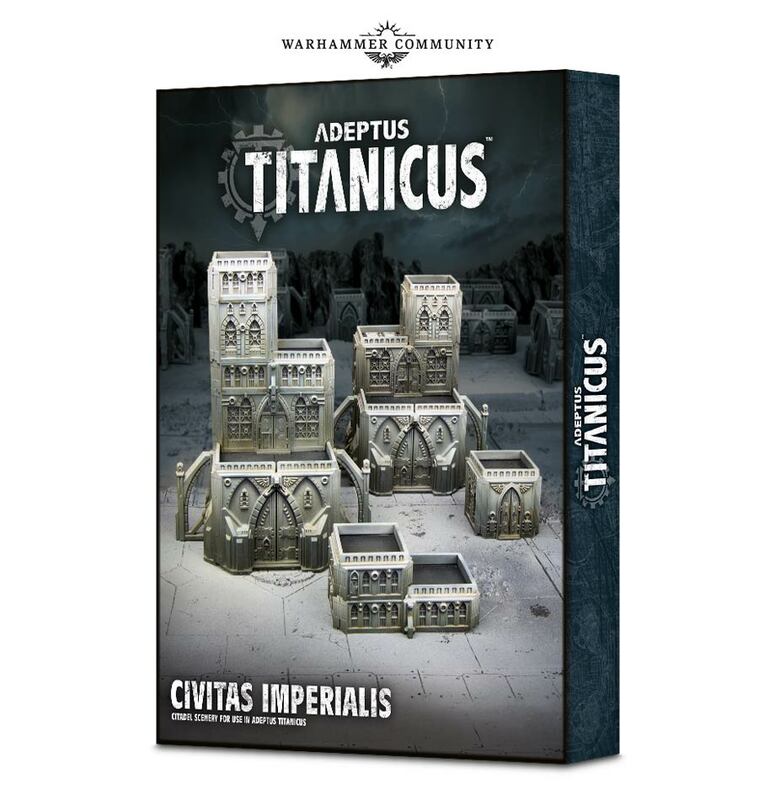 This is just the beginning for Adeptus Titanicus, with more Titans, Knights, rules and expansions planned for the future to bring your titanic battles to life. You’ll be able to pre-order your launch day goodies next weekend – stay tuned to Warhammer Community in the meantime for a series of in-depth previews of the game. Necromunda Cawdor, Stormcast and Nighthaunt preorders!